This is a beta of [FNV|FO3|FO4|FO4VR|TES5|SSE|TES5VR|ENDERAL]LODGen with terrain LOD meshes and textures generation. This is for experienced mod authors and users that know how to use xEdit, xLODGen or DynDOLOD already. Unzip into a dedicated folder outside of any game folders or special Windows folders like Program Files. Use -o:"c:\OutputPath\" commandline parameter to change where files are generated to, default is the game folder. See the included Terrain-LOD-Readme.txt for a brief explanation of the settings. Read the hints that are shown when the mouse pointer rests on a setting. Ask specific questions in this thread for a more in-depth explanation if required and share feedback (with screenshots) about results or problems. These tools generate LOD meshes and textures "exactly" like CK, but not like the meshes and textures are shipping with the games (they are often manually edited). However, these tools provide more options and higher resolutions (use the x64 version if there are memory errors because you believe you require 4k or higher) and can be updated to add more useful features and options. I did some testing in the different games, but finding the best combinations of options and settings requires lots of testing and are a matter of personal opinion and which game is used, the load order, mods, even different worldspaces probably. That means, I am only able to give generic guidelines and hints to sent you off to find and test for yourself and share your results. My main interested is that generations works correctly and without problems for now. The object and tree LOD generation is the same as the current versions of xEdit / xLODGen. Refer to their respective descriptions and explanations. 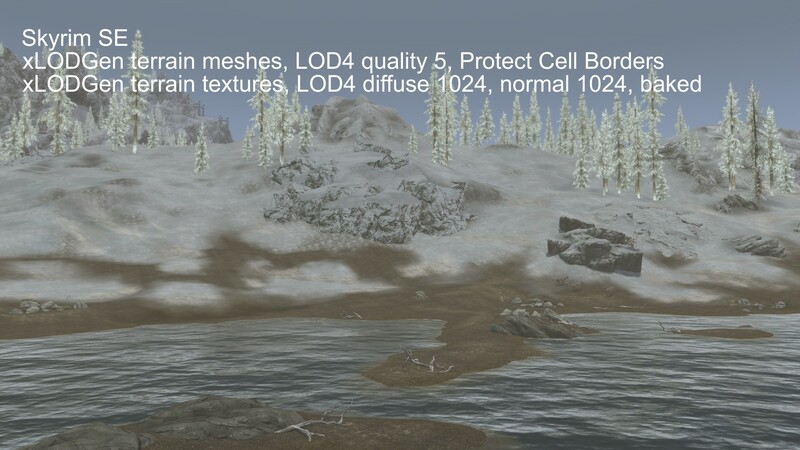 Obviously, users of Skryim/Enderal/Skyrim SE/Skyrim VR continue to use the easier and more comprehensive DynDOLOD for drastically improved object and tree LOD generation. 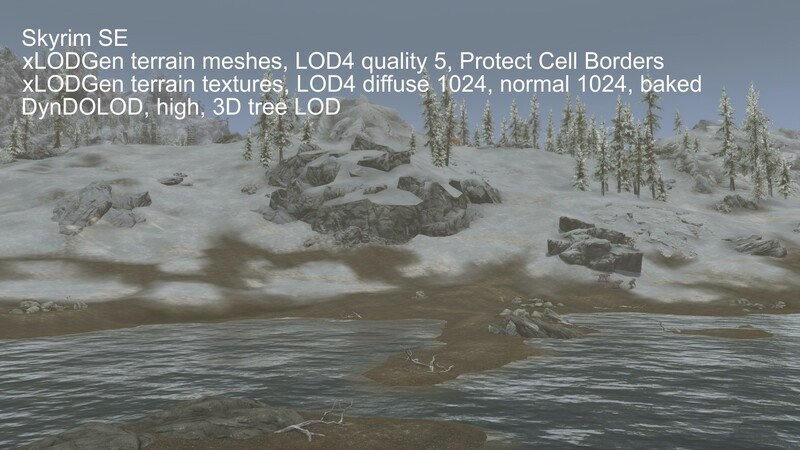 Set quality of meshes for LOD4 to 5 and then +5 for each next level. Or just set levels 8/16/32 to 10. Check protect cell borders (yes it fixes the ugly terrain drops at outer cell borders that still exist in Fallout 4). Use the max vertices setting only if you want to hard limit max file size. Set Optimize Unseen to off for first generation, so you have something to compare to later. Start experimenting with on or a value of 500 for LOD32 and compare coastlines and file size to other settings. Check Specific Chunk and drop down to 32 and set SW to test with a specific file with lots of water, river etc. Set texture sizes to 512 for a start. Larger sizes and large world spaces will take a considerable time (like 15 to 30 minutes or more easily). Each higher resolution means quadruple the work. Use DXT1 for diffuse and 565 for normal. Check mipmaps and raise steepness, uncheck Bake normal maps. For now, leave the Brightness, Contrast and Gamma at 0 and 1.0 respectively. It seems that only Skyrim CK and Skyrim SE CK are manipulating the intensity of the textures to adjust for the noise.dds and the god awful "improved" snow shader of Skyrim SE (just turn that thing off, really). If textures seem too dark in the game, brighten the noise.dds instead or vice versa. That way you can get perfectly matching LOD textures that look just like the textures in the loaded cells. For Skyrim a good average color of the noise texture seems to be around #C0. See below for a couple noise texture downloads. If you want to test larger texture sizes, use the chunk option to limit the number of textures that need to be generated. For example, check [x] Specific chunk, leave the drop down empty and set WS to the lower left cell coordinate of an 32x32 area, like 0, 0. It will then generate all textures up to 31,31. Not all worldspaces have their origin at 0,0 so you will have to check already generated meshes/texture filenames for their lower left coordinates. Put in game data folder obviously. 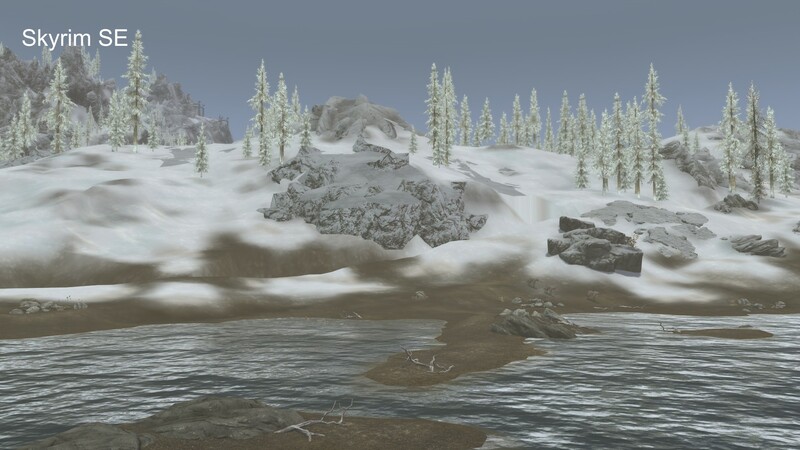 Adds back terrain for Skyrim (Tamriel worldspace) at the outer edges so there is no missing terrain meshes/textures when generating terrain LOD for Skyrim. Only required to be loaded when generating terrain LOD. No harm done when loaded in-game but typically the player can not get close to these areas, so it is rather useless. Examples for Skyrim. Install to game folder like any other texture mod. The noise texture is applied in-game on top of terrain LOD textures, so no effect for LOD generation. Edited by sheson, 21 March 2019 - 06:16 AM. delete the mentioned texture file (and its normal *_n.dds/*_msn.dds sibling). Restart xLODGen turn off meshes and then generate textures with the same settings again. xLODGen will skip already existing files if possible and just generate the ones it has to do in order to create the LOD levels that include the missing texture files from the output path. If the error seems reproducible, replace xLODGen.exe and xLODGenx64.exe with this slower version and see if the error message is more detailed. If the error is reproducable, test if turning off mipmaps, steepnees, baking normal-maps clears it up. Edited by sheson, 15 February 2018 - 07:24 PM. Just to clarify, I am guessing those plugin resources at the above link will not be necessary here, for FO4 ? (Just started a new game so losing those would not be a problem, I can easily start again after their removal if necessary). 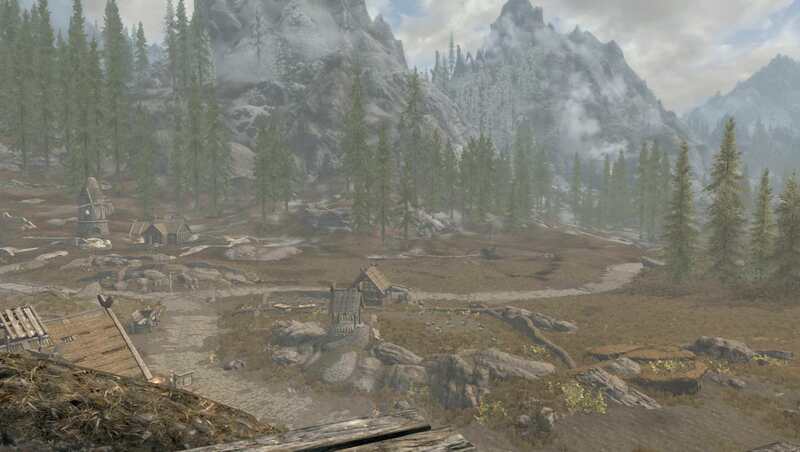 And for those of us using DynDOLOD 2.36 beta 7, we would use this new SSELODGen beta 2 prior to DynDOLOD ? This is an update for xLODgen.exe, including FO4LODGen.exe from the other thread. So all instructions, resources etc. for object LOD (and tree LOD if game has it) still apply. If you want to update an existing FO4LODGen installation for example, just copy all files and overwrite anything older, then rename xLODGen.exe and xLODGenx64.exe to FO4LODGen.exe and FO4LODGenx64.exe. There is probably no use to generate terrain LOD for SanctuaryHillsWorld unless your name is Ryan Salvatore and you are using CK64 for Fallout 4. You can generate terrain LOD at any time independently of object and tree LOD, they have no connection to each whatsoever. Just make sure to not check the object and tree LOD generation in xLODGen if you use DynDOLOD. Edited by sheson, 16 February 2018 - 07:20 AM. My first run, enabled Terrain, enabled baking normals, but left all settings at defaults for the first run through .. Doing a run with Protect Cell borders on next, I think your choice of defaults for all of the settings is a good setup. Edited by alt3rn1ty, 16 February 2018 - 02:44 PM. A note for Fallout 3/TTW modders. Dirt02 and Asphalt01 were completely deleted from the game, so they show up as NULL landscape textures if you turn simple records off in xEdit. Today it was discovered that burntground01 still has it's static record but the texture itself is missing. The GECK replaces these with the default texture which is dirt01, however when you delete a texture from a quad it will not remove it entirely and make a NULL entry instead. Edited by RoyBatty, 16 February 2018 - 04:33 PM. xLODGen beta 4 will still print a message about the missing texture, but instead of ignoring the layer, use the default texture. I have extracted xLODGen into its own folder away from games etc as suggested, and then my personal take from there was to right click on xLODGen.exe, and choose Send to Desktop to create an Icon, giving it the switches in icon properties for the appropriate game mode and output folder desired .. Then do the same again for another game. So both FO4 and SSE have their own FO4LODGen and SSELODGen icons on the desktop. Subsequent runs have given new logs for FO4 and SSE ..
.. But they are named with FO4Edit_log.txt and SSEEdit_log.txt respectively. 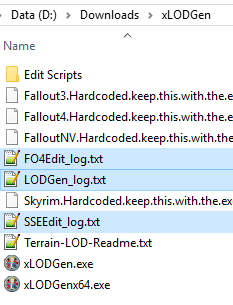 Should they be named FO4LODGen_log.txt and SSELODGen_Log.txt instead ? Edited by alt3rn1ty, 16 February 2018 - 05:18 PM. The log file name is hardcoded like this into xEdit and xLODGen is just a renamed xEdit (instead of using -lodgen command line parameter). There maybe a reason the tool mode is not used for the log filename. That is a question for Zilav. Thanks... So this is an addition to FNVLODgen? Does this mod replace https://www.nexusmod...gas/mods/63139? Great work sheson as usual. Always moving this community forward. This is a beta of a never version of FNVLODGen (and the other listed games) and eventually this update will make it to the official Nexus pages of FNVLODGen (and the others). Instead of using pre-made LOD mods, you can use this to create (hi-res) terrain meshes/textures for the current load order yourself. xLODGen is generally easier to use and much quicker than GECK/CK/Oscape and can produce much, (even way too much) higher quality results. Edited by sheson, 17 February 2018 - 05:23 AM. 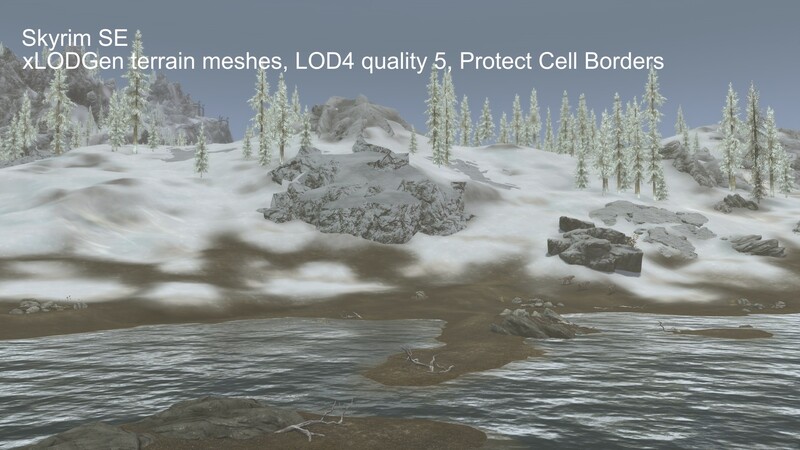 Just got to say that Protect Cell Borders is a godsend, for Skyrim SE I have been using Skyland textures, Simply Bigger Trees, plus Verdant Grass with the latter fading just before the distant grass noise texture kicks in. Unfortunately those occasional land miss matches were the only fly in the ointment we couldn't do anything about before so kind of got used to turning a blind eye to them ..
Edit : No errors for SSE. Edited by alt3rn1ty, 17 February 2018 - 07:51 AM. The sad part is, that this "problem" still exists in Fallout 4 and its CK, too.